IT’S OFFICIALLY THAT time of year again. Between today and Sunday, more than 50,000 festival-goers will flock to Stradbally, Co Laois for this year’s Electric Picnic. This year’s headline acts include Kendrick Lamar, Massive Attack, and The Prodigy, while there’s a strong local feel to the lineup, with Irish acts Picture This, Gavin James, and Walking on Cars all featuring prominently on the bill. Meanwhile, the Comedy Tent, Mindfield and the Theatre of Food all return for the festival’s 15th year, offering plenty for those who want to take a break from the main acts. If you’re planning on taking public transport, there are plenty of options, although you might want to hurry to get your ticket. If you’re going from Dublin, Bus Éireann are operating a number of services departing from Custom House Quay. Advance booking is recommended, but some tickets will be available to buy this morning. Marathon Travel are running a service from the 3Arena on North Wall Quay, which will cost €30 if you haven’t booked in advance. Trains are also running to Portlaoise Station, from Limerick, Cork and Dublin, with a Martleys shuttle bus operating from the station to Stradbally for €5 each way. For those driving to the festival, you can take the M7 (both northbound from Limerick and southbound from Dublin), the M8 if you’re coming from Cork and elsewhere in the south, or the N80 (from the west, and from Carlow and the south-east). However, organisers have warned that there are major road works on the two main routes leading to Stradbally, the M7 and M8, which have been causing big delays. Speeds are reduced to 60km per hour on the road, so drivers are told to prepare for delays, particularly at rush hour. All festival-goers are also advised to leave plenty of time to get to the venue, and you can find all you need to know about getting there here. You’d have to have been out of the country or living under a rock not to have noticed that it’s been an incredibly warm summer in Ireland. 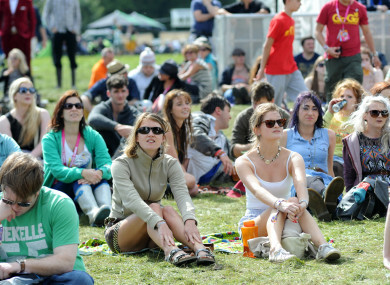 And while the heat has died off a bit in recent weeks, the good news is that the forecast is good for Stradbally this weekend, with mild weather and sun expected across the weekend. Top temperatures of 20 degrees Celsius are expected over the weekend, with Saturday expected to be the best day weather-wise. The bad news is that there’s also a risk of showers, particularly on Sunday, so make sure to bring a rain jacket just in case. TheJournal.ie office has its fair share of seasoned Electric Picnic pros who were happy to share their recommendations to help you make the most of the weekend. Bring a hot water bottle with you. You can get hot water from Centra to keep yourself warm. Wrap your cans up in a bin bag so if they burst in your bag, everything won’t get soaked. Also bring a couple of cheap ponchos. If your tent starts leaking, you can rip the poncho down one side so you have a large plastic sheet that you can throw over the top of it. Check out Theatre of Food at around 4pm on Sunday for some scintillating chat. “The All-Ireland final will be shown in the An Puball Gaeilge tent at Mindfield on Sunday. Email “Heading to Electric Picnic? Here's everything you need to know”. Feedback on “Heading to Electric Picnic? Here's everything you need to know”.